RUevents.rutgers.edu is a great way to find out what’s happening on campus on any given day! No matter your interests, there is something for everyone at Rutgers! From academics to the arts and athletics, our hope is that you find what you’re looking for and have a great time doing it! Here are things to do on campus. Have fun. Show your spirit at a football game at High Point Solutions Stadium. Play a game of golf at the 18-hole, PGA-sanctioned Rutgers Golf Course. Gaze at the stars at the Robert A. Schommer Astronomical Observatory, located in the dome on the roof of the Serin Physics Building. Public viewing takes place the second and fourth Thursday nights of each month. Take the road less traveled by biking or walking on the Bike Paths. Take a dip with Family Swim at the Sonny Werblin Recreation Center, just one of many Rutgers Recreation activities open to the general public for a small fee. Explore the floor of the Life Sciences Building atrium which depicts microscopic to macroscopic life forms with 360 bronze sculptures embedded in the floor, the work of sculptor Michele Oka Doner. Discover our Public Sculpture situated around campus. Check out the mastodon and other skeletons and fossils at the Rutgers Geology Museum. View the collection of 60,000 objects at one of the largest and most distinguished university-based museums at the Zimmerli Art Museum. Stroll among historical buildings on the Old Queen’s campus. Shop for books, school supplies, Rutgers clothing, and gifts at the Barnes & Noble at Rutgers University Bookstore. Climb the rock wall! It’s free to all Rutgers students and costs $5 for day passes for non-student guests. Find one-of-a-kind book and document collections at the Rutgers University Libraries. See the works of students, faculty members, and distinguished outside artists at the Mason Gross Galleries at Civic Square. Observe the animals at the George H. Cook Farm. 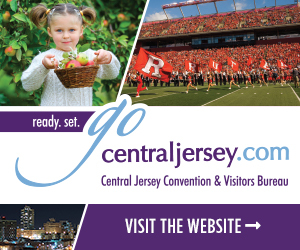 Take in the beauty at the Rutgers Gardens with acres of specialized collections including a rhododendron and azalea display garden, an ornamental tree collection and a bamboo forest. Bug out at the Entomology Museum with a collection of over 200,000 pinned specimens. Visits are by appointment only. Passion Puddle is man-made pond with a lighted fountain, surrounded by an expanse of green, perfect for Frisbee or reading on a warm afternoon. It’s a favorite place to relax amid the hectic pace of collegiate life. Take in a first-run movie at Rutgers Cinema in the Livingston Plaza. 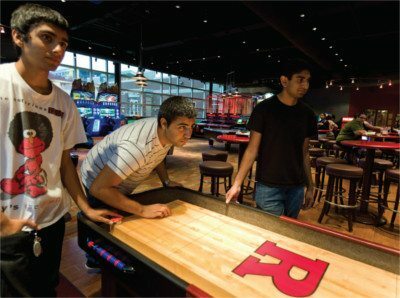 At the RutgersZone, watch your favorite teams on one of nine flat screen TVs, including a 93-inch video wall; challenge your friends to a game of skeeball, pool, air hockey, basketball, shuffleboard, and more; or indulge in one of our signature ice cream cones, floats, milkshakes, desserts, or appetizers. Explore one of the largest patches of old-growth forest in our area at the Rutgers Ecological Preserve. Catch some rays, see Rutgers’ 1.4 megawatt solar farm and 8 megawatt solar parking canopy on the Livingston campus which combined supply 60% of the power on the campus. Stroll by the water jets in the fountain on Livingston for a quick cool-off on a hot summer day. Purchase all your tech needs at kite+key, the Rutgers Tech Store, get a haircut and styled at The Wright Cut, enjoy fresh yogurt, Asian Fusion or Mexican grill. Paddle the D&R Canal in a canoe from the Outdoor Center and enjoy the fall foliage, winter scenery or spring blooms! Take the charming Ravine Bridge, also called the “Kissing Bridge,” across the scenic ravine to the Mason Gross Preforming Arts Center. Catch a performance at the Mason Gross Performing Arts Center. At Voorhees Chapel you can find a German Schuke organ, rare in the United States. Hang out in downtown New Brunswick where you can find Ethiopian food, nightclubs and boutique shops just a quick stroll away from College Avenue. Enjoy a performance in the New Brunswick theater district. Take a glimpse into Piscataway’s past as a port city with the Cornelius Low House. Just like George Washington, Alexander Hamilton and other prominent figures, you can visit the Buccleuch Mansion, built in 1739. Public tours are held Sunday afternoons, June to October. Check out all the Revolutionary War sites in New Brunswick. See replica and reconstructed 18th and 19th Century schoolhouses, homes, barracks, and more with educational workshops, seminars and lectures, exhibitions, concerts and storytelling at the East Jersey Olde Town Village.